Chanel new with tag mini classic cross body white , Aspen collection autumn 2015. Shoulder drop 24". Comes with hologram, tag, id card and original dust cover. 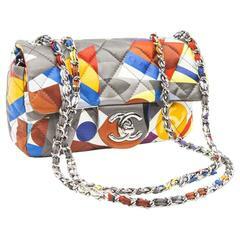 Chanel reissue quilted pewter leather cross body wallet on a chain. Shoulder drop 25". Comes with hologram and original dust cover.